For some children, America is failing to live up to its reputation as the land of opportunity – and often, the neighborhood where they grew up is the single biggest predictor of what their future will hold. 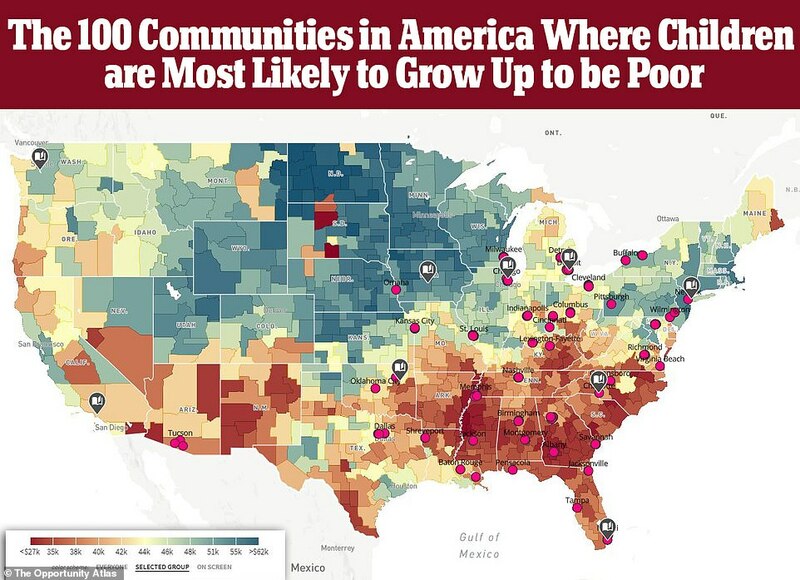 Some of the most upwardly mobile communities in the country are just a few miles away from those where children are most likely to grow up to perpetuate a multi-generational cycle of poverty, according to The Opportunity Atlas, an interactive map that uses more than three decades of government data to predict childhood outcomes. The Atlas bases its projections on U.S. Census data and federal tax information gathered over time (through 2015) on people born from 1978-1983 – now age 34-40. The project, conducted in partnership by the U.S. Census and Harvard University's Opportunity Insights group, illustrates the average actual outcomes of children who grew up in every community in America. 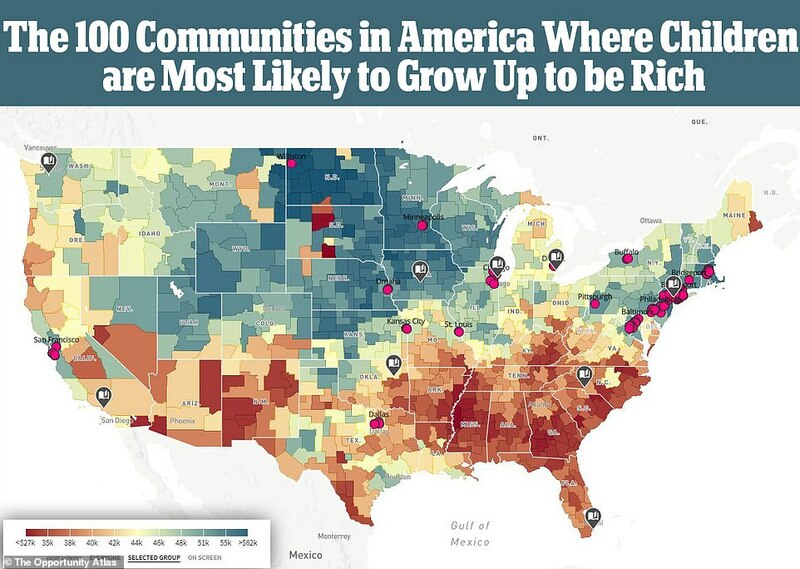 The maps reveal some national trends on poverty and wealth – for example, the American South has the greatest concentration in the nation of children who grow up without ever escaping poverty, while the Northeast leads in outcomes of upward mobility. However, they are most useful when used at the most granular level to analyze highly localized data broken down into 'Census tracts' (geographic regions defined for taking a Census) for a detailed snapshot of poverty, wealth and opportunity in America. While the U.S. is considered the land of opportunity – a nation where everyone is supposed to have a chance to pursue happiness – the Atlas offers evidence that for some children that ideal is an unfulfilled promise. In some cases simply merely because of where they were raised. 'There is an untold narrative about the fact that there is a divide between those who have money and those who don't,' said Lillian Singh, director of the racial wealth divide initiative for Washington D.C.-based think tank Prosperity Now. 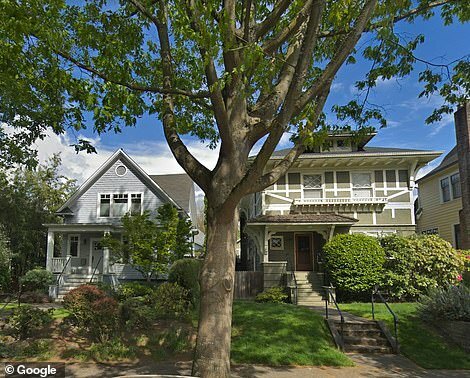 'It really is a difference between the haves and have-nots in this country,' she told DailyMail.com. For example, in Pittsburgh, children from the predominately African American neighborhood of Larimer grew up to have median incomes ranging from $17,000-$22,000 a year and a 3.5-7.4 percent incarceration rate, while just 10 miles away in mostly white Mt. Lebanon, median salaries for people who grew up there range from $64,000-$70,000 and the incarceration rate is less than 1 percent. The pattern repeats itself around the country, with incarceration rates and multigenerational poverty significantly higher in certain communities – and sometimes the defining difference in a child's future comes down to less than a mile. The city of Hollywood, Florida – 19 miles north of Miami – is home to just such a division. People who grew up in the Emerald Hills community of Hollywood had a median salary ranging from $65,000-$67,000 and a less than 1 percent incarceration rate. 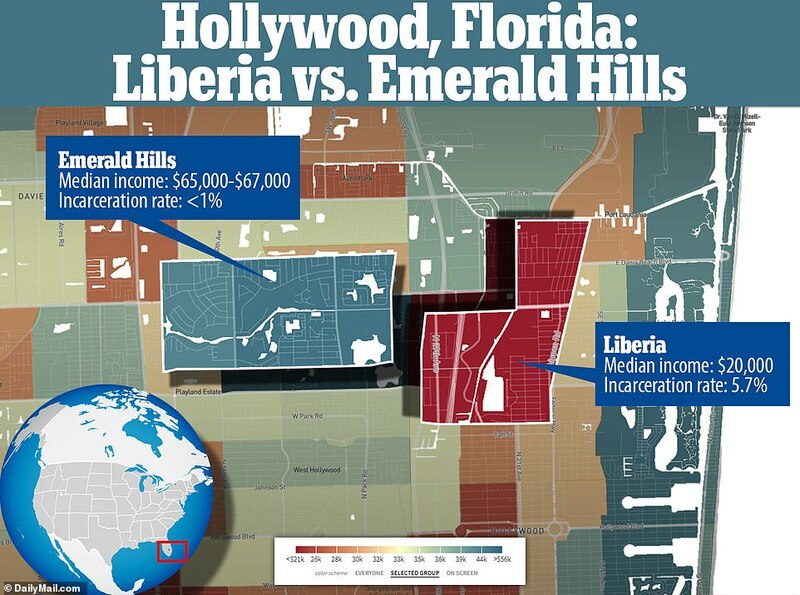 Just across the railroad tracks and Interstate-95 from Emerald Hills is the community of Liberia, where children grew up to the reality of a $20,000 median salary and a 5.7 percent incarceration rate. Liberia was established as the railroad was being built in that region in the 1920s and 1930s, largely as a community for African American rail workers. 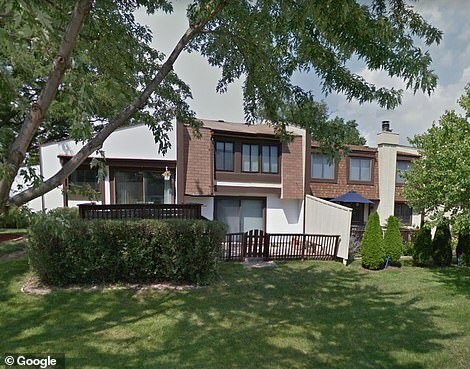 By contrast, Emerald Hills was built in the early 1970s on pasture land for wealthy, predominately Jewish and Italian residents, Hollywood city Commissioner Richard Blattner told DailyMail.com. Blattner attributes some of the differences in outcomes to educational disparities. Many parents in Emerald Hills enroll their children in private and charter schools, while Liberia, on the other hand, has a high proportion of single-parent families who Blattner said place less of an emphasis on education. He pointed to the failure of several free and low-cost preschool programs in Liberia due to low participation and community enrollment. This map illustrates the juxtaposition of two neighboring communities in Miami with very different outcomes for the children who live there. In blue, is the Emerald Hills community, with a median income ranging from $65,000-$67,000 and a less than 1 percent incarceration rate. In red is the community of Liberia, with a median salary of $20,000 and a 5.7 percent incarceration rate. 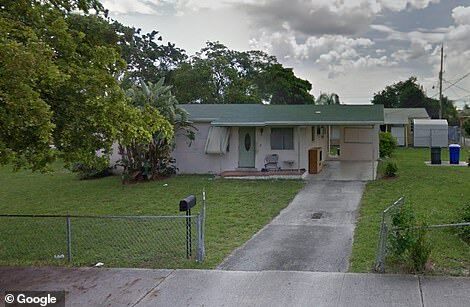 The photo is a typical house in the Emerald Hills community in Hollywood, Florida - 19 miles north of Miami. 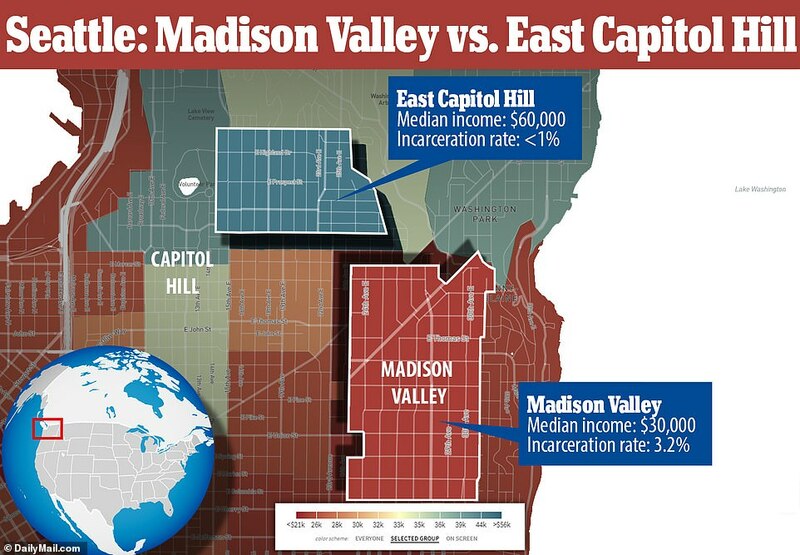 Similarly, children from the low-income Madison Valley section of Seattle's Central District grew up to have a median income of $30,000 and an incarceration rate of 3.2 percent, while just to the north – across East Roy Street – those who grew up in the eastern section of the Capitol Hill neighborhood have a median income of $60,000 and a less than 1 percent incarceration rate. The disparity is a legacy dating back to the early 1900s, when Seattle had racially restricted covenants that limited where Jews, Asians and African Americans were allowed to live, said Nicole Vallestero Keenan-Lai, executive director of Puget Sound Sage, a Seattle-based community revitalization nonprofit. 'It's a long history of some explicit policies that led to intergenerational poverty,' she told DailyMail.com. The separation was perpetuated decades later through the introduction of redlining – a discriminatory real estate practice in which lenders refuse to provide loans or extend credit to minorities in certain parts of a town or city. In Seattle this manifested itself with the Asian population largely contained in what is now known as the International District, while Jewish people and African Americans were limited to the Central District. The demographic makeup of those communities persists today. 'It's not just one generation or two, but since the formation of the city itself we've created a lack of access to opportunity,' Vallestero Keenan-Lai said. It is impossible to talk about poverty and income disparity in America without also addressing race. Beyond income disparity, the Opportunity Atlas illustrates a consistent pattern of poor communities predominately populated by people of color. 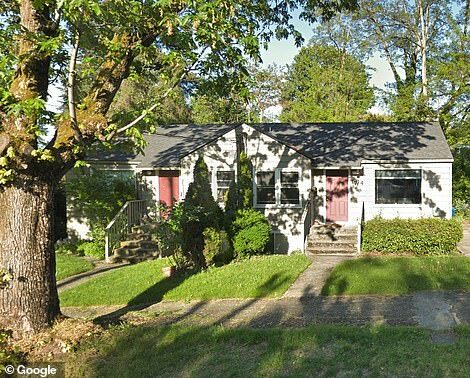 The photo shows homes in the eastern section of Seattle's Capitol Hill neighborhood, where children grew up to achieve median incomes of $60,000 and a less than 1 percent incarceration rate. For example, Dallas-Fort Worth, Texas is home to nine Census tracts with some of the best predictors for childhood earning outcomes – as well as nine where children have some of the worst financial potential in the nation. The communities with the best outcomes are predominately white, while the poor ones are mostly African American. It's about 15 miles and a 20 minute drive from Dallas' Cedar Crest neighborhood to the northeastern section of North Dallas, and while the two communities look similar, they couldn't be more different when it comes to childhood outcomes. Median incomes among children growing up in the northeast section of North Dallas range from $62,000 - $75,000 and their incarceration rate was below 1 percent, while children from Cedar Crest are making a median of $21,000 and incarceration rates range from 4.7 -7.8 percent. Cedar Crest was once a middle class black community, but in the past three decades many have moved away to wealthier suburbs leaving behind poor African Americans in a community that has limited options when it comes to grocery stores, pharmacies and retail shops, while North Dallas is home to high-end options like Louis Vuitton, said ReShunda Morrow, program manager at the Dallas-based Shared Housing Center. Similarly, in Atlanta, the Grove Park neighborhood – formerly known as Bankhead – has limited resources to serve the high number of African Americans caught in the community's multigenerational cycle of poverty, said Debra Edelson, executive director of the Grove Park Foundation, a nonprofit focused on combating poverty. Children from Grove Park grew up to have a median income of $19,000 and a 5.5 percent incarceration rate. Meanwhile, children from the Buckhead community, just five miles northeast, had a median income ranging from $65,000-$83,000 and an incarceration rate of less than 1 percent. An estimated 30 percent of the homes in Grove Park are unoccupied, and the community doesn't have basic infrastructure like curbs, gutters and sidewalks, she said. Edelson said it was a 'very comfortable' middle class African American neighborhood for nearly two decades in the 1960s and 1970s, but that population began moving to wealthier areas in the 1980s and 1990s, leading to disinvestment in the area. Things only worsened after the economic collapse of 2008. Chicago has similar issues in many of it's neighborhoods, where the boundaries of poverty are particularly pronounced along racial lines. To the west, children who grew up in the Indian Head Park community had a median income of $74,000 a year and a less than 1 percent incarceration rate – and it's among the 100 most upwardly mobile communities in the nation. Meanwhile children raised 13 miles away in Englewood, on the South Side of Chicago – one of the 100 communities in America where children are least likely to escape poverty – had median incomes ranging between $17,000-$20,000 and incarceration rates from 4.4-8.3 percent. 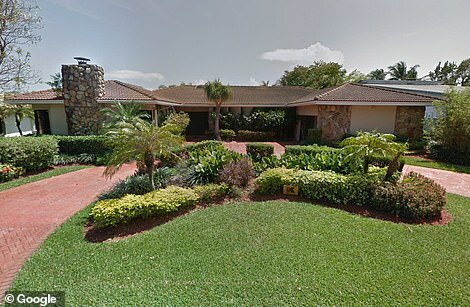 Indian Head Park is a community of perfectly manicured lawns with large middle- and upper-middle class homes set back on spacious plots of land. Blackhawk Park is nestled in the center of the community, providing children with a safe place to play. 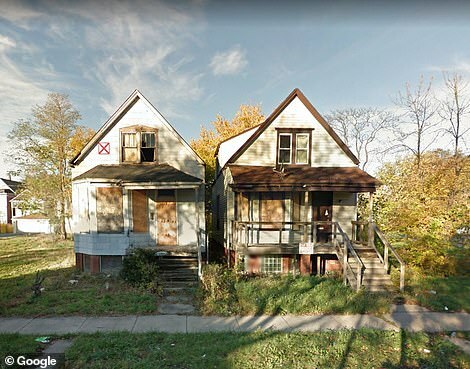 The photo shows two abandoned, boarded up houses in the Englewood neighborhood of Chicago, one of the communities with the worst financial outcomes in the country for children who grow up here. Englewood, on the other hand, is filled with condemned homes, boarded up buildings and overgrown, empty lots. The housing that is occupied is cramped together, often with garbage littering the front lawns. The city closed six schools in Englewood, which remain shuttered, covered in graffiti and subject to frequent vandalism. 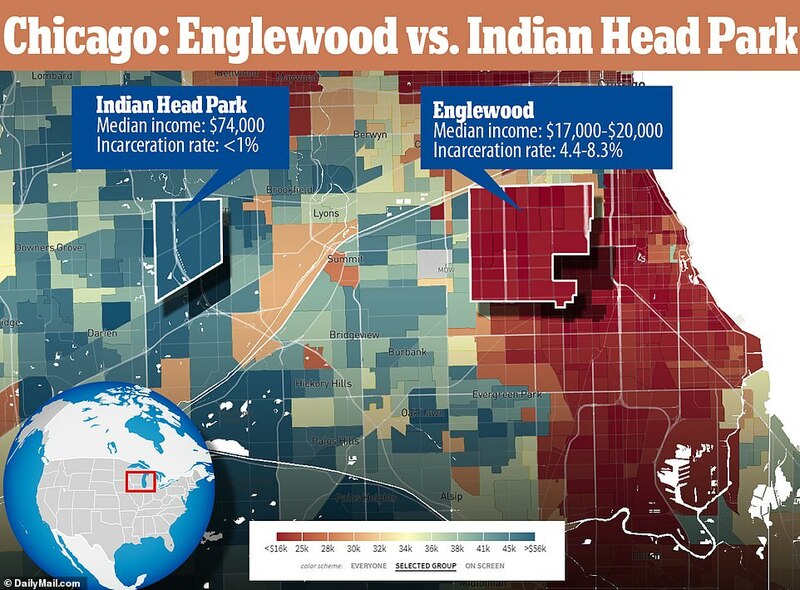 Englewood is also consistently ranked as one of the most dangerous in a city now known for high rates of violent crime. Asiaha Butler, president of RAGE, a nonprofit focused on community revitalization in Englewood, estimates Englewood has 10,000 vacant plots of land due to demolitions of zombie homes – housing that has been abandoned by the owner or left in disrepair after being repossessed by the bank. The community currently has very low rates of home ownership, leading to absent and frequently slum landlords allowing the appearance of the neighborhood to deteriorate overall.